The EU Victims Directive comes into force this month. 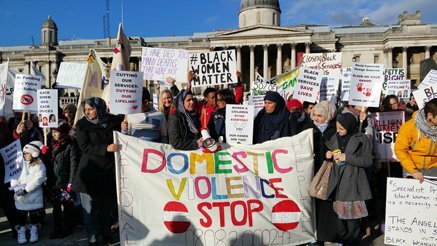 Will it prevent the further decimation of Black and minority ethnic organisations offering specialised services to women facing violence in the UK? This is part two of an article addressing the cuts to the women's sector in the UK. Read part one. The Istanbul Convention on preventing and combating violence against women and domestic violence, which the UK has so far failed to ratify, obliges member states to adequately fund both general and specialist services. The delay in ratification quite likely arises from the fact that the spending cuts applied so heavily to this sector means that the UK will not be compliant with the Convention. It is important to be clear about what specialist services entail as the gradual de-recognition of the sector represents a tectonic defeat for feminist politics. ‘Specialist’ is defined as women-only services and within that it includes targeting of specific groups like BME (Black and Minority Ethnic) women and/or specific types of violence like FGM. The importance of women only spaces for women who have faced male violence has been central to feminist activism. For Dr Liz Kelly, head of CWASU, (Child and Women Abuse Studies, Metropolitan University) the specialist women’s sector simply includes organisations with roots in the particular communities that they serve as that experience shapes the perspectives within which they deliver services. This definition has the advantage of excluding the large, generic, empire-building organisations which attempt to bolster their specialist credentials by employing a BME worker or two. But as Marai Larasi, Director of Imkaan, says there is world of difference between a BME organisation and a BME service. The identification of specific threats to BME women, be it forced marriage or immigration rules which trap them in violent marriages, campaigning around those issues, demanding more resources from government, changing policy and legislation have been initiated by BME led organisations such as Southall Black Sisters, at least where the above two issues are concerned. However, local authorities under financial pressure just don’t get this. BME organisations have been falling like dominoes – either closing, facing deep cuts and/or much reduced services. Roshni in Nottingham - closed; Ashiana in Sheffield - lost its domestic violence contract; Saheli in Manchester dealing with 40% cuts to its core funding; Panahghar in Leicester and Coventry also struggling with cuts. The latest BME organisation to be facing imminent closure Apna Haq (Our Right) is based in Rotherham. On 21st November, they organised a march from Trafalgar Square to Downing Street to hand in a petition to protect these services and a report on the State of the Sector produced by Imkaan. According to the report, in the last financial year in London, 733 BME women sought refuge spaces and only 154 were successful. There are over 34 dedicated BME VAWG (Violence Against Women and Girls) services in the UK, of which half are refuge providers. 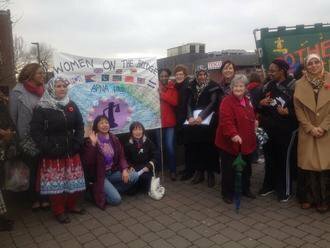 Apna Haq’s contract to deliver domestic violence services was won by a white led organisation affiliated to Women’s Aid, Rotherham Rise, which provides services to both men and women. Zlakha Ahmed, Director of Apna Haq, says that the Council’s tender awarded no additional marks for track record. There was no recognition for the huge amount of work they had done on forced marriage and raising awareness of the issue in the community. This pattern was repeated across the country. The Imkaan report found that the weighting in many council tenders was skewed 70% towards value for money and 30% towards quality. Larger organisations benefit from this weighting as they are likely to have lower unit costs and not much of a track record. Apna Haq were also marked down on their answer to the question: how would you support men facing violence? They said they would signpost them to other services. Apparently, they would have scored better if they had said that they would provide a low-level service to men. The Council has, however, given them a five month reprieve until March. Additionally, they are hoping to use their reserves to allow them to remain in existence for another three months (eight months in total) while they seek other sources of funding. Zlakha says that of the 44 women service users, all including the Roma women, bar one, have decided to stay with Apna Haq, and that five of their workers who attended the induction day at Rotherham Rise returned to Apna Haq despite job uncertainties because they were not confident that the all-white management team would understand BME issues. It seems particularly ironic that the only secular and progressive BME women’s organisation should be facing the axe in a city which has been rocked by the revelation of largescale grooming of young white girls by gangs of Asian men. Racist media coverage and the backlash orchestrated by the likes of UKIP and EDL has had an adverse impact on the women coming to Apna Haq. Women report self-imposed curfews in order to stay safe. One woman said ‘They’ve taken our rights away - make us feel that we can’t live here - we have no place here - look at my colour and punish me.’ An under-reported aspect of these child abuse cases is that Asian girls are also groomed and sexually abused but as the Jay report into the Rotherham scandal acknowledged, ‘women and girls in the Pakistani community in Rotherham should have been encouraged and empowered by the authorities to speak out about perpetrators and their own experiences as victims of sexual exploitation.’ The absence of strong Asian women’s voices was acknowledged in the Ofsted inspection of Apna Haq and Louise Casey’s inquiry into Rotherham. Despite this, Apna Haq is facing the chop. 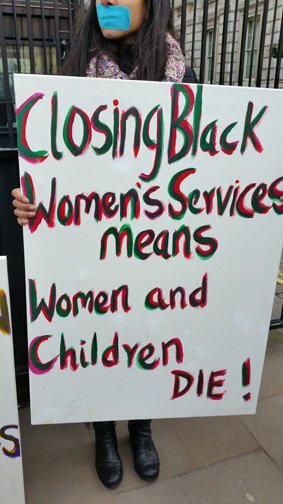 Zlakha highlighted the gaps that result from the decimation of the BME sector: in Sheffield, shockingly, five BME women have been killed in the last two years since Ashiana lost their domestic violence contract to a generic service. In all the investigations that followed these deaths, the question that was being asked was why these women had not been identified and supported. The answer was obvious: BME women overwhelmingly preferred BME organisations as the Imkaan survey confirmed. One of the BME directors quoted anonymously in the Imkaan report felt that ‘competition from [mainstream] women's organisations is the biggest threat. This has been raised and I have been told it does not happen because it is not ethical, however it is happening.’ According to Liz Kelly, market forces have led to a shift in the ethics of practice as normally organisations would not bid against a sister service unless a failing service needed to be rescued. Polly Neate, Chief Executive of Women’s Aid (WAFE), says that their National Service Standards stipulate that members must work co-operatively with other specialist organisations, especially BME ones. As members are autonomous organisations, WAFE cannot enforce discipline but they do have sanctions at their disposal: for example, they do not grant a quality mark to those organisations which do not adhere to these standards, and a quality mark is often a precondition for getting a grant or tendering for council contracts. Polly sees the issue of power and inequality between small and large organisations as one that plagues the whole voluntary sector and is hoping to involve the NCVO (The National Council for Voluntary Organisations) in a sector wide initiative to resolve it. Women’s Aid also provide support to smaller organisations struggling in consortia arrangements. The pressure to merge has morphed into the setting up of consortia where each constituent organisation is notionally independent. However, Hannana Siddiqi of Southall Black Sisters (SBS) describes her experience of consortia as endless meetings on top of an already heavy workload. The lead organisation retains most of the power, but many smaller organisations may not have the capacity or desire to lead and end up feeling marginalised within the consortium. If members do not share values and a common understanding of the issues this can lead to further tensions. A particularly dangerous development highlighted by Hannana is the move to fund short-term, three month interventions in high risk/emergency cases. Long term intervention and support of standard risk cases are not given enough weighting in the commissioning process. The state is worried about homicide and about being held accountable for its failure to protect women at risk of death. It seems a short-sighted strategy when neglect of so-called low risk cases can easily turn them into emergencies. All of this bleakness may be about to dissipate. New legal duties in the EU Victims Directive are due to come into force in November 2015 which will have to be actioned by the UK government. The directive requires the provision of specialised services to women facing violence. Even better, it requires these services to be provided regardless of the victim’s citizenship status. This may prove to be a very important tool in the hands of BME organisations seeking to hold the police accountable who have been known to use a call out in a domestic violence incident as a fishing expedition to check the immigration status of the individuals involved. Marai Larasi is anxious that the government may not engage with it in a climate of strong anti-EU sentiment. Another important change introduced by this directive is the way in which VAWG services will be commissioned in the future. They need not go out to competitive tendering for a ‘social service’ contract that is worth less than 750,000 Euros. As BME organisations tend to be smaller and most contracts are worth less than that, this has the potential to restore solidarity and sisterhood to the sector. Furthermore, the 2015 Spending Review has announced that the much derided tampon tax will yield £15m which will be made available to women’s charities, although not all of it will go to the 'Violence Against Women' sector. Are these imminent changes cause for cautious optimism that the sector may have turned the corner?